The Company Lab (CO.LAB) has announced the eight teams who will be participating in the HealthTech Accelerator, which launched on April 2 in partnership with Erlanger Health System and Unum. Companies in the program are developing solutions directly tied to the healthcare and benefits industries, which range from medical devices to compliant communication and back-of-office tools. Canopy Innovations is an e-learning language platform designed to help hospitals and community clinics eliminate the language barrier in healthcare by 2030. Healing Innovations is a medical device company and creator of the Rise&Walk, a patented gait training device that provides efficient and affordable walking therapy to paralyzed or physically impaired patients. KelCor is a medical device start-up developing simple, efficient, and cost-effective product solutions to improve infection control and patient care. Medical Search Technologies is a SaaS company creating searchable data from unstructured text, such as radiology reports and patient progress notes, to manage compliance and identify care pathways for complex medical conditions. MedX Services is a complete medicine management company that is dedicated to improving medication adherence and reducing the costs associated with non-adherence. Pretel is developing wearable biosensors, proprietary regional uterine physiologic signal detection software, and personalized labor progress status algorithms to reduce preterm birth and the costly poor outcomes of induction delivery. Rhinogram is a pioneering Telehealth solution that removes patient-provider communication barriers via texting and increases provider efficiency by reducing staffing costs, enabling reimbursable virtual consults, and leading to new patient acquisition. VendRx, Inc. is an automated prescription dispensing system designed to be located at the point of convenience so as to increase patient adherence and reduce healthcare costs. 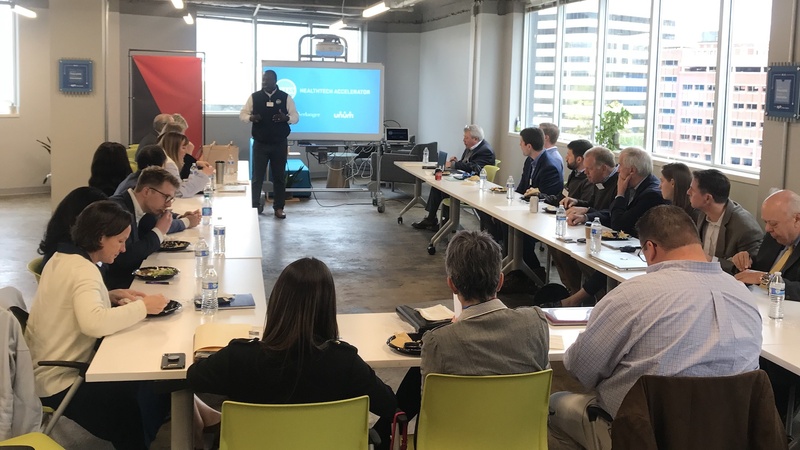 “Our team at Erlanger Health System is energized about the ventures that will be coming forward from this inaugural HealthTech Accelerator cohort and the subsequent cohorts. Erlanger is honored to play a role in advancing innovation in healthcare prevention and delivery in Chattanooga that will benefit those we serve across the region,” said Matt Gibson, Chief Strategy Officer of Erlanger Health System. Unum and Erlanger employees will serve as mentors, offering their industry expertise, insight and connections. The HealthTech Accelerator launched on April 2 and runs through June 5. Learn more about the program at colab.co/healthtech.